From the outset of the Iraq invasion the Bush Administration has acted as a force of instability in Iraq. Continued American presence in Iraq will only add to further instability. The smart kids in Washington are warning against a "precipitous withdrawal". Instead, the adults are talking about an "orderly withdrawal" from Iraq that will take up to 18 months. In the mean time, the Surgin’ General, David Patraeus, has embarked on a strategy that will make that withdrawal a failure. U.S. commanders are offering large sums to enlist, at breakneck pace, their former enemies, handing them broad security powers in a risky effort to tame this fractious area south of Baghdad in Babil province and, literally, buy time for national reconciliation. American generals insist they are not creating militias. In contracts with the U.S. military, the sheiks are referred to as "security contractors." Each of their "guards" will receive 70 percent of an Iraqi policeman’s salary. U.S. commanders call them "concerned citizens," evoking suburban neighborhood watch groups. But interviews with ground commanders and tribal leaders offer a window into how the United States is financing a new constellation of mostly Sunni armed groups with murky allegiances and shady pasts. This new strategy, much hailed in Washington as a sign of progress, is setting the stage for a bloody confrontation between Shia and Sunni in the wake of an American withdrawal. Far from creating conditions for political reconciliation this strategy is in effect arming both sides of a civil war. 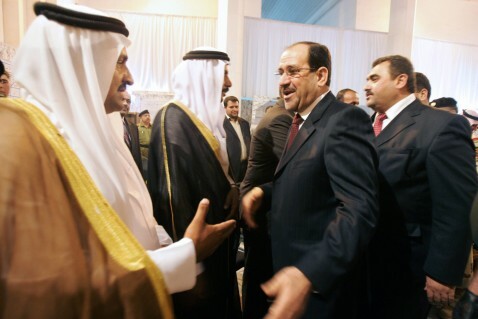 This strategy of arming both sides in a civil conflict will serve to further delay an American withdrawal from Iraq. This strategy, and the entire "surge" in general, is predicated on the misguided notion that the violence in Iraq must be brought under control first before national reconciliation can take place. What Mr. Bush and his Surgin’ General ignore is that the violence is being driven by political divisions, not causing it. By arming both sides the prospects of national reconciliation becomes even more remote. What is hailed as "success" by the so-called "pundits" who got us into this mess is in fact creating conditions for continued failure in Iraq. In the short term, the failure to disarm and demobilize former combatants effectively may contribute to an immediate relapse into war. In the medium and long term, incomplete or ineffective reintegration of ex-combatants into civil society may lead to armed criminality by those former soldiers who have no other means of earning a living. In States where internal structures for civil order have already been weakened by an internecine conflict, this increase in armed criminality would be a further detriment to consolidating peace. Today the Bush Administration is further fueling the conflict by its short-sighted arming of both Shia and Sunni combatants in Iraq. In the past four years the United States has become a party to the civil conflict in Iraq. It is almost certainly no longer in a position to broker a political reconciliation in Iraq. The past four years of conflict and the counter-productive strategies of the Bush Administration may have made the possibility of political reconciliation without a bloody settling of scores all but impossible. But if there is any hope of averting a bloody collapse of Iraq it lies in political reconciliation. It may be time for the Bush Administration to politically and militarily disengage from Iraq and transition responsibility to a third party such as a regional working group or the United Nations. Under the auspices of this third party a renewed effort can be made to secure regional cooperation and begin the process of political reconciliation. It may also set the stage for the withdrawal of American troops and the beginning of DDR under an international force without an American face. However, for political reconciliation to begin the Bush Administration must first stop arming the warring sides in Iraq. The alternative is a continued, counter-productive and bloody occupation of Iraq. This entry was posted in Foreign Policy, Iraq. Bookmark the permalink. U.S. government has had a legacy of supplying arms to the criminals that they indented to use against their other enemies.